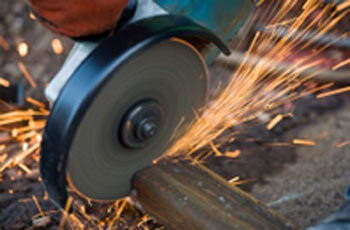 Advice on using an Angle Grinder for a variety of tasks including cutting, grinding and polishing stone or metal. 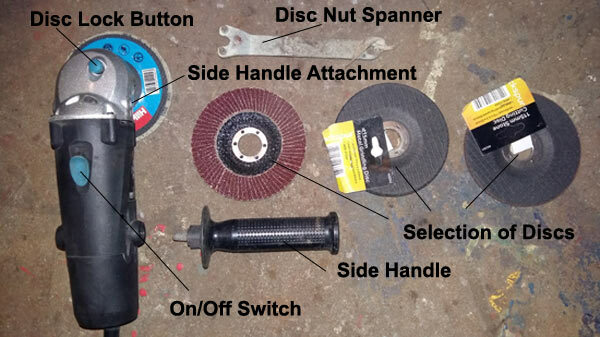 You will also learn about how to chose the correct angle grinder for your cutting or grinding job and also about the various different attachments and discs available for angle grinders such as cutting discs, grinding discs, polishing discs, flap discs and also wire brush knot cups for cleaning rust. We also tell you about how to stay safe when using an angle grinder including what clothing and safety equipment you should wear. Although pretty much every major manufacturer (DeWalt, Makita, Bosch etc….) make and sell their own brand of angle grinder, in essence, they are all pretty much the same and have similar main features, but the real differences come in the overall build quality of the tool and the power of the motor. It is possible to buy an angle grinder for less than £10 but as the saying goes, you get what you pay for. The build quality won’t be that great and the motor will probably be lacking in power, but if it’s only going to get used on the odd occasion for sharpening the mower blade, then a cheaper model will be more than good enough. If, however, you foresee it getting used for longer lengths of time or on a daily basis, a more expensive, powerful and robust model is probably the way to go as you can be almost certain that it will not let you down halfway through a job. What Different Types of Grinders are There? 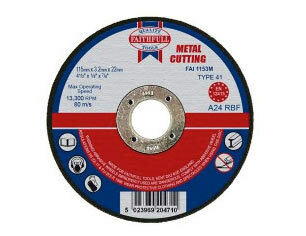 The most important factor when choosing which angle grinder to purchase is the depth or size of material to cut or grind and the type of material you will be working with. This in turn will direct you to which size and kind of disc you will need. 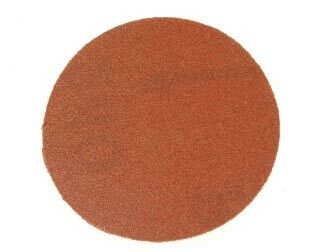 The most common size of disc used for DIY needs (and in general across most areas of use) are the 115mm discs (the 115mm being the size of the disc). Regardless of the type of disc you will be using e.g. 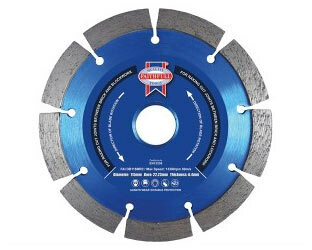 cutting, smoothing, grinding discs etc… you will be able to obtain these in 115mm (4 1/2 inches) varieties. Due to the fact that the smaller 115mm discs (regardless of type e.g. cutting, grinding, polishing etc….) are the most common and readily available they also tend to be the cheapest. 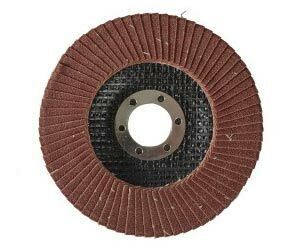 In terms of size, angle grinders are available in small, general and light purpose (up to 7 inches or 180mm) and large (9 inch or 230mm), with the smaller tools being suited to things such as sharpening blades, cutting reinforcing bars or cleaning rust. When it comes to heavier work such as cutting large diameter steel pipes, steel I-beams or large paving slabs then the larger 230mm machines are more suited. Essentially, these are exactly the same but on a larger scale. They should also have the same features as their smaller counter-parts (these are discussed further down the page). Due to their size and weight they are a fair bit trickier to handle and manage than the smaller ones and although they generally tend to operate at slower speeds, the torque they produce can be substantial. Smaller angle grinders tend to operate at faster speeds, upwards and over 10,000rpm whereas larger grinders normally rotate at around 6000 – 6500rpm. 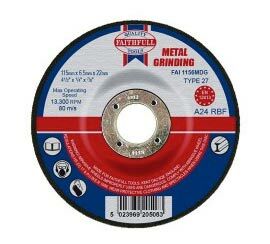 Generally, with faster speeds comes more rapid wear on the discs, but due to the relatively cheap costs of 115mm discs, this isn’t much of a consideration when it comes to deciding the size of grinder you should purchase, this decision really comes down to the type of job you will be doing. As a summary, if you are looking to get an angle grinder for general DIY usage around the home, a cheaper 115mm corded model should be more than adequate for your needs but if you are looking to use it on a more regular, heavy duty and intense basis a more expensive model might suit you better or even a larger 230mm grinder might be the one to go for. This power tool is designed mainly for either cutting through materials or grinding. In terms of cutting, their mainly only good for making straight cuts, but can be used for curves when one has more experience. Cleaning debris, paint and rust from metal surfaces e.g. gates and fences, car parts, trowels and spades, cement mixers, tidying up welds etc…. As you can see, which ever trade you may work in or enjoy as a hobby at the weekends an angle grinder is a “must have” tool that you will certainly find regular use for. After some practice with the tool you will begin to get used to its ways and the manner in which it operates and through this you will then probably find additional uses for it. With some practice you can even cut curves and shapes in bricks, tiles or slabs. If you are particularly handy with it you may find that you can do this in one hit, but generally this is done in a few stages. 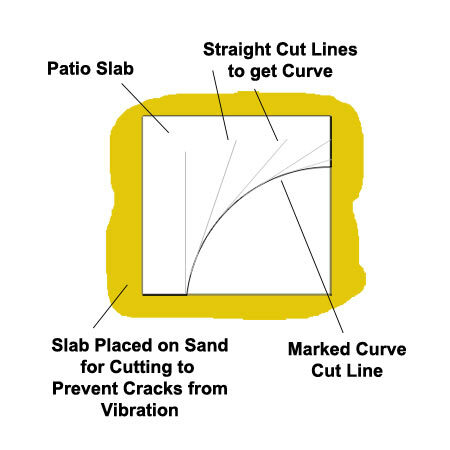 To cut a curve in a patio slab for example you would first start by marking out the curve you want to cut on the slab and then use a series of straight cuts with a cutting blade along the curve to remove the unwanted areas. Once done you should then have your rough shape that you can then continue to shape until you have a nice smooth curve. 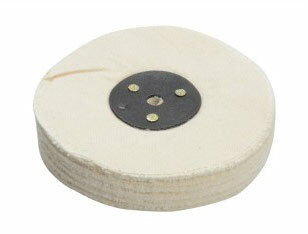 Discs are purpose made for the job they were created for, either cutting, grinding, polishing or sanding. Do not attempt to cut with a grinding disc or grind with a cutting disc. Each disc should be labeled either "Stone" or "Metal". 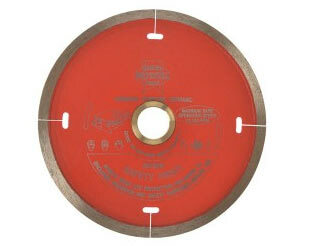 The material you work on should only be cut or ground with the disc labeled for that material. 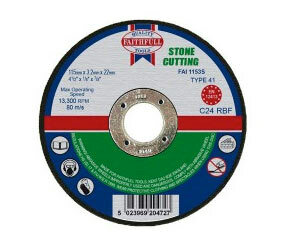 Stone cutting discs will actually cut metal but they will tend to tear up and fall apart as they chop their way through and due to this the flying debris can cause a great deal of harm and damage to yourself, others around you and also to any nearby objects. 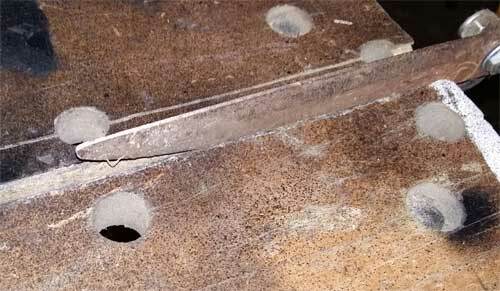 With the above in mind you should always grind and cut with the open section of the blade facing away from you. On looking at an angle grinder, one thing that may catch your eye is the guard that covers about half of the disc when it is inserted. This guard is adjustable and by loosening it slightly you will be able to adjust it so that which ever position you are using the grinder in, the guard will be between you and the disc. On this note, never ever be tempted to use your grinder without the guard attached, it’s there for a reason! 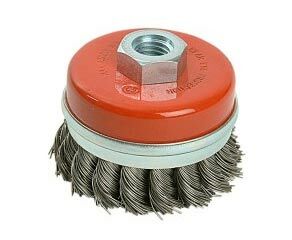 Wire Brush and Twist Knot Cups: These are basically wire brushes for your grinder. Groups of wires are twisted up and placed around the perimeter of the cup that then screws onto your grinder. When screwing up make sure you tighten them right up. You will need to press the disc lock button in to lock any rotation and then use a spanner to tighten the nut on top of the cup. Discs and attachments vary considerably in quality and the best indicator is usually price. Cheaper discs (both grinding and cutting discs) will wear out considerably more quickly than expensive discs, but they are cheaper so depending on how regularly you will be using them, this may balance out. Regardless of the manufacturer, pretty much all angle grinders will have the same, basic features. The majority of models sold come with a basic on/off push slide switch, so the disc will power up immediately. Respect should be given to this action and the power tool should be held with a firm grip when powered on. In respect to the switch, most manufacturers will configure this so that you have to keep your finger pressed on to it for the tool to run. The second you release your finger the power to the tool is cut. This is mainly for safety reasons as if anything happens, then you will likely release your finger first. As with all power tools, eye and hand protection should be worn at all times. There will be a lot of debris and sparks if working on metal from this power tool even with the guard in place. 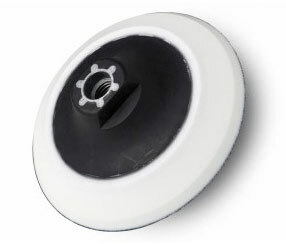 All grinders come with a guard which protects the user from debris thrown out by the disc which is normally sent in a direction away from the user. This guard can be moved to allow use in awkward working positions. The locking nut of a grinder will always tighten in the direction which will not allow it to come undone when the it’s in motion. As we have mentioned, grinders also have a disc locking button which allows you to lock the turning action of the wheel while you undo and tighten for new discs or attachments. Most will also come with a detachable side handle. In most cases, this can be fixed for both left and right hand use and also sometimes on the top of the tool meaning that you can have full control regardless of what position you are using it in. 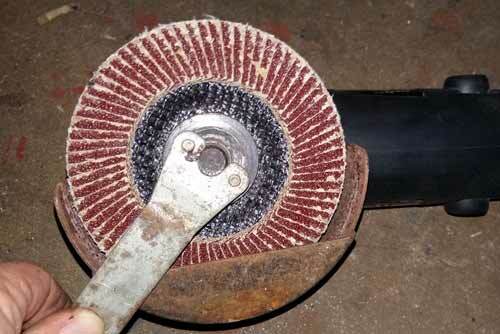 One final point to mention in terms of the grinder itself are the motor brushes. 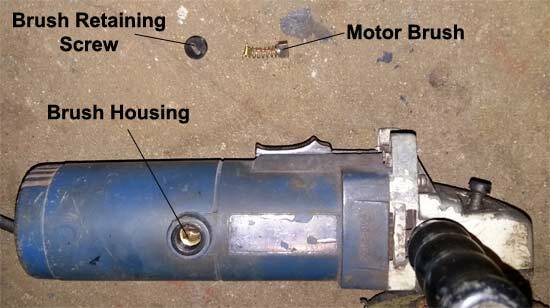 The brushes are contained out side of the motor and allow it to work. In essence, the motor coils need to be connected to complete an electrical circuit and to do this a copper or brass slip ring (or communicator as they are also known) is fixed to a sprung shaft with the springs pressing the brush that is attached to a section of copper wire on to the rings so that current is conducted and supplied. The brushes themselves can wear down to such a point that the tool will stop working. At this point you will need to replace them. 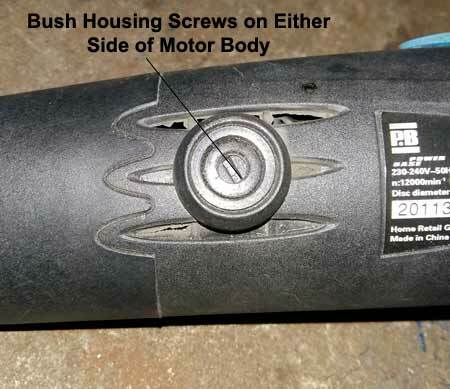 As you can see in he image below, you will need to unscrew the two retaining screws on either side of the motor body, purchase some new brushes and screw them back in. Cutting or Grinding (general): This applies to both metal and stone – Make sure that the item you are working on is clamped firmly to a solid surface. To hold the item in place, ideally you would want to use a vice fixed to a workbench, a Workmate or by using suitable clamps to hold the item firmly to a bench or solid work surface. The main point here is that the item you are working on is held while you are working on it. It’s no good trying to hold the item with one hand and use the grinder with the other or even ask a friend or family member to hold it for you as angle grinders produce a fair amount of torque and can easily “bite” or “slip” and go shooting off causing untold damage to hands and other body parts, so stay safe and do it properly! 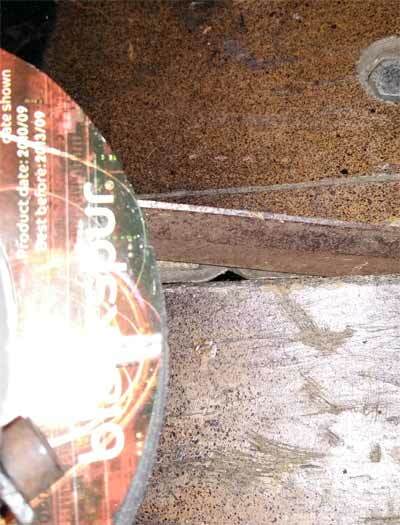 With your item properly secured so that it cannot move, fit the correct disc or attachment for the job and ensure it’s fixed tightly to the grinder itself. Before you start cutting, sanding or grinding (and with out the tool actually running) perform a few practice runs across your item so that you know exactly how you need to hold the grinder and in what position it needs to be in. Move the side handle if needs be to make the tool more manageable. Once practiced you can then actually make a start. Start the tool up and begin, moving it gently across your required surface or markings. Don’t be tempted to “go at it flat out”, stop every 10-20 seconds to make sure that you are working on the right area or keeping to your markings. Let the tool do the work for you, you shouldn’t need to apply much pressure to it if any at all. 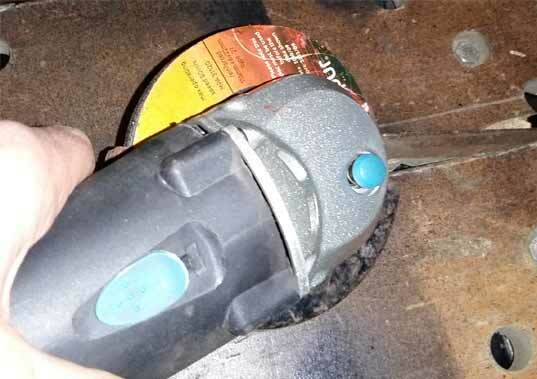 Once you are finished, turn the grinder off and allow the disc to run down until it stops. Don’t put it down with the disc still spinning as this can cause damage. Also, leave the item to cool down (especially if it’s metal). Grinding, sanding and cutting will cause the object you are working on to heat up, in most cases, until it’s red hot, so don’t burn yourself. Check your work over to make sure all is well and that you are happy. If you need to do any more go ahead but check your progress regularly as once you’ve taken it off or cut it you can’t put it back on or joint it back together.